Today I thought I would blog about this beautiful song (hymn), “Dros Gymru’n Gwlad” (For Wales, our country), written by the Reverend Lewis Valentine, and here performed by Dafydd Iwan. It is sometimes referred to as Wales’ second national anthem. This version of the song is, in fact, entitled “Gweddi Dros Gymru” (A Prayer for Wales) by Dafydd Iwan; but it is the same song, just with a different (and maybe more apt) title. 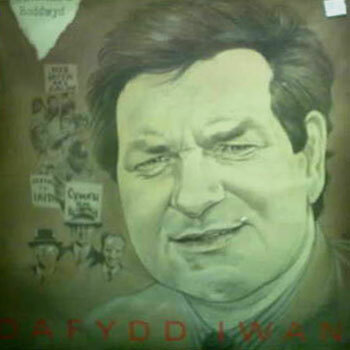 “Gweddi dros Gymru” (Prayer for Wales) appeared on Dafydd Iwan’s 1986 album “Gwinllan a Roddwyd” (A vineyard was given). I will blog next week about who Lewis Valentine was, because he holds a particular place in Welsh history for an act of defiance he committed in 1936 along with DJ Williams and Saunders Lewis. But, today I will just concentrate on this song/hymn. “Dros Gymru’n Gwlad” is usually set to the tune of Sibelius’ Finlandia, as it is in the video I include below. O! crea hi yn Gymru ar dy lun. Yn seinio fry haeddiannau’r Addfwyn Oen. And now for my translation. As always, I am not going to attempt to retain any rhyme or meter, just translate the words as best I can; so that you get the meaning of what Lewis Valentine was trying to say in his song/hymn. Oh! create a Wales in Your image. Ringing out on high, the deserves of the Gentle Lamb. Here is an alternative translation which I found. It is far more poetic and less clumsy than mine, but less true to what Lewis Valentine was actually saying in his lyrics. O make our Wales in your own image Lord. Here is a video I have created on YouTube of Dafydd Iwan’s version of this song/hymn. Had you heard of this song before? What is the redshift of the Cosmic Microwave Background (CMB)? Last week, as I mentioned in this blog here, I had an article on the Cosmic Microwave Background’s accidental discovery in 1965 published in The Conversation. Here is a link to the article. As of writing this, there have been two questions/comments. One was from what I, quite frankly, refer to as a religious nutter, although that may be a bit harsh! But, the second comment/question by a Mark Robson was very interesting, so I thought I would blog the answer here. Mark asked how we know the redshift of the CMB if it has no emission or absorption lines, which is the usual way to determine redshifts of e.g. stars and galaxies. I decided that the answer deserves its own blogpost – so here it is. As I explain in more detail in my book on the CMB, the origin of the CMB is from the time that the Universe had cooled enough so that hydrogen atoms could form from the sea of protons and electrons that existed in the early Universe. Prior to when the CMB was “created”, the temperature was too high for hydrogen atoms to exist; electrons were prevented from combining with protons to form atoms because the energy of the photons in the Universe’s radiation (given by where is the frequency) and of the thermal energy of the electrons was high enough to ionise any hydrogen atoms that did form. But, as the Universe expanded it cooled. This means that, as the Universe expands, the temperature just decreases in inverse proportion to its size. Double the size of the Universe, and the temperature will halve. When the Universe had cooled to about 3,000K it was cool enough for the electrons to finally combine with the protons and form neutral hydrogen. At this temperature the photons were not energetic enough to ionise any hydrogen atoms, and the electrons had lost enough thermal energy that they too could not ionise electrons bound to protons. Finally, for the first time in the Universe’s history, neutral hydrogen atoms could form. For reasons that I have never properly understood, astronomers and cosmologists tend to call this event recombination, although really it was combination, without the ‘re’ as it was happening for the first time. A term I prefer more is decoupling, it is when matter and radiation in the Universe decoupled, and the radiation was free to travel through the Universe. Before decoupling, the photons could not travel very far before they scattered off free electrons; after decoupling they were free to travel and this is the radiation we see as the CMB. It was shown by Richard Tolman in 1934 in a book entitled Relativity, Thermodynamics, and Cosmology that a blackbody will retain its blackbody spectrum as the Universe expands; so the blackbody produced at the time of decoupling will have retained its blackbody spectrum through to the current epoch. But, because the Universe has expanded, the peak of the spectrum will have been stretched by the expansion of space (so it is not correct to think of the CMB spectrum as having cooled down, rather than space has expanded and stretched its peak emission to a lower temperature). The peak of a blackbody spectrum is related to its temperature in a very precise way, it is given by Wien’s displacement law, which I blogged about here. In 1990 the FIRAS instrument on the NASA satellite COBE (COsmic Background Explorer) measured the spectrum of the CMB to high precision, and found it to be currently at a temperature of (as an aside, the spectrum measured by FIRAS was the most perfect blackbody spectrum ever observed in nature). The spectrum of the CMB as measured by the FIRAS instrument on COBE in 1990. It is the most perfect blackbody spectrum in nature ever observed. The error bars are four hundred times larger than normal, just so one can see them! 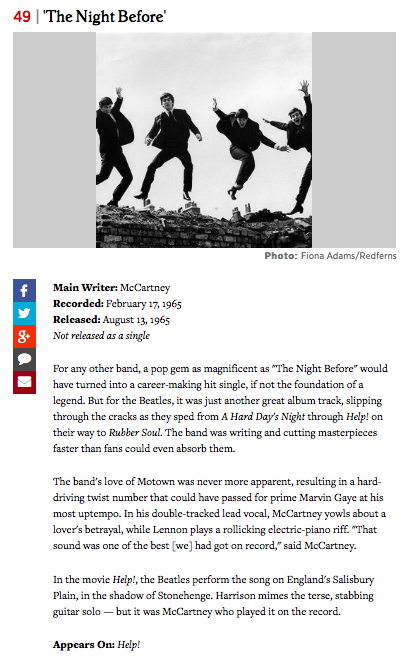 At number 49 in Rolling Stone Magazine’s 100 greatest Beatles songs is “The Night Before”, from their 1965 album and movie Help. It is very much a Paul McCartney song, with Lennon’s only contribution being the harmonies, and playing electric piano on the song. In the movie, the song is performed on Salisbury Plain, surrounded by tanks. “The Night Before” is the second track on the first side of the album Help, sandwiched between two Lennon songs, “Help” and “You’ve Got To Hide Your Love Away”. Over the last couple of weeks I have been writing about the Cosmic Microwave Background, as this month of July marks the 50th anniversary since the paper announcing its discovery was published. 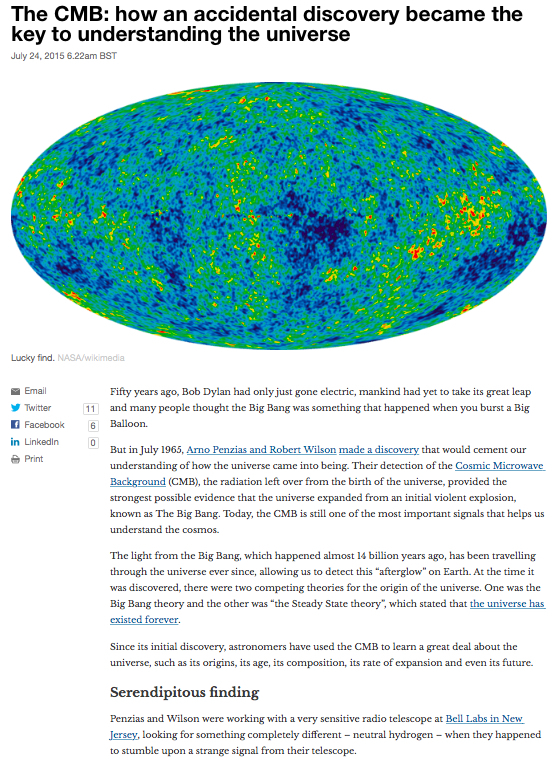 In this blog here I showed the original 1948 paper in which Ralph Alpher and Robert Hermann predicted its existence, and in this blog here, I re-posted something that I had written back in April 2013, before I had started research for the book I have published on the CMB. Today I had been planning to write about its accidental discovery by Bell Labs astronomers Arno Penzias and Robert Wilson, but on Thursday of last week I had the following article published in The Conversation, if you follow this link you can read the original article. This article obviates the need for me to blog about the history of the discovery, you may as well just read it in The Conversation. However, what is contained in this article is a summary of an even-more fascinating story, which you can read about in all its wonderful detail in my book, which can be bought directly from Springer, or from other booksellers such as Amazon. 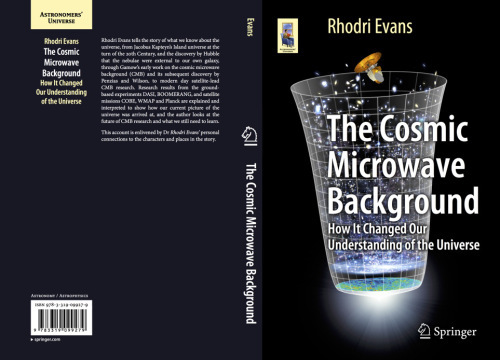 My book “The Cosmic Microwave Background – how it changed our understanding of the Universe” is published by Springer and can be found by following this link. To finish up this series on the CMB and its discovery, next week I will write about the Penzias and Wilson paper, and the accompanying paper by Robert Dicke and his Princeton team which attempted to explain the observation that Penzias and Wilson had made. 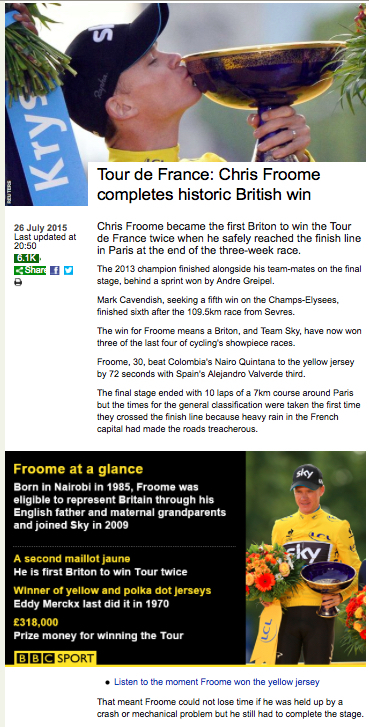 Yesterday (Sunday the 26th July), Chris Froome won the Tour de France for the second time, having also won it in 2013. He won by one of the narrowest margins in recent history, with Colombia’s Nairo Quintana only 72 seconds behind him. Had Quintana not had a very poor ride on the second day of the 19-stage tour, when he lost over one and a half minutes to Froome, it may well have been Quintana winning the 2015 tour. Chris Froome won the Tour de France for the second time, having also won in 2013. Two things have struck me about this year’s tour. Let me first talk about the good – the penultimate stage up Alpe d’Huez, the most legendary climb in Tour de France history. With Quintana being a climbing specialist, Froome was in real danger of losing his overall lead to the Colombian. In an epic ride up the tortuous hairpins (“switch-backs” for my American reader(s) ) of this fearsome stage, Quintana attacked again and again, and Froome and his Sky teammates did all they could to make sure the gap that the Colombian opened up was not too great. It was mesmerising TV, with the sheer determination of Froome’s face evident as he dug in to make sure he did not lose too much time to the prolific mountain climber. Although Quintana halved Froome’s lead, it was not enough to surpass him in the General Classification, and Froome knew at the top of the mountain that he had won the Tour. Now let me talk about the bad – the way that certain elements of the French press and public have treated Froome. It is appalling. He has had urine thrown at him, been spat at countless times, and why? Because the French don’t like him? I am a little unsure whether Britain should be claiming that Froome is British, given that he was born in Kenya and grew up in South Africa; but whatever his nationality he deserves some respect from the cycling press and fans. Surely we should be applauding cyclists like Froome and Bradley Wiggins, who ride drug-free and are trying to help cycling regain its reputation as a reformed sport after the debacle of Lance Armstrong and the institutionalised doping of which he was the most prominent example. Why some elements are so anti-Froome is beyond my comprehension, he comes across as humble and hardworking; not the kind of brash over-confidence that Armstrong exhibited. Now we can move on to the most exciting three months of sport of 2015 – the Rugby World Cup! Wales have their first warm-up match against Ireland on the 8th of August in Cardiff, and I will be blogging about that on the 10th. I can’t wait!!!! Today I thought I would share “Woman in Chains” by Tears for Fears. I blogged here about their album Seeds of Love when I shared its title track Sowing the Seeds of Love. For me, along with that song, “Woman in Chains” is the other great song on a pretty good album. “Woman in Chains” features Phil Collins (of Genesis) on drums, and was released in 1989 and got to number 26 in the Disunited Kingdom singles charts and to 36 in the U.S. It is particularly noteworthy for the singing of Oleta Adams, whom the band had discovered in 1985 singing in a hotel bar in Kansas City. Which is your favourite track on the Seeds of Love album? Today I thought I would start a count down of Rolling Stone Magazine’s 100 greatest Beatles songs. I have decided not to count down the whole 100, as if I do one of the songs in the list once a week it is going to take two years! So, I will do the top 50, which is till going to take a year. Starting at number 50 is “Got To Get You Into My Life”. This Paul McCartney song is off the Beatles’ 1966 album <em"Revolver, which I blogged about here. The song is a bit of a homage to Motown, with a very colourful brass section and upbeat tempo typical of the Motown hits of the day. 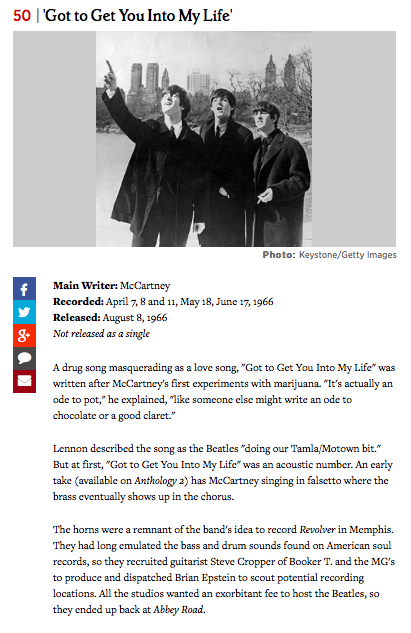 At number 50 in Rolling Stone Magazine’s list of the 100 greatest Beatles songs is “Got To Get You Into My Life”.